This striking new image, taken with the powerful HAWK-I infrared camera on ESO’s Very Large Telescope at Paranal Observatory in Chile, shows NGC 1365. Astronomers have made the first reliable measurement of a supermassive black hole’s spin, showcasing a technique that could help unravel the mysteries of these monsters’ growth and evolution.The enormous black hole at the centre of the spiral galaxy NGC 1365 is spinning about 84 per cent as fast as Einstein’s general theory of relativity allows it to, researchers determined. The find demonstrates that at least some supermassive black holes are rotating rapidly — a claim previous studies had hinted at but failed to confirm. NGC 1365, located about 56 million light-years from Earth in the constellation Fornax, does indeed harbor a gigantic black hole — one as massive as several million suns. And this behemoth is blasting out enormous quantities of energy as it gobbles up gas and other nearby matter, making it an intriguing target for astronomers. In the new study, researchers analysed observations two X-ray space telescopes — the European Space Agency’s XMM-Newton observatory and NASA’s Nuclear Spectroscopic Telescope Array (NuSTAR) — made of NGC 1365 in July 2012. By zeroing in on high-energy light emitted by iron atoms, the telescopes were able to trace the motion of the flat, rotating accretion disk that circles NGC 1365’s black hole and funnels gas and dust into its greedy maw. Astronomers found that the emissions are strongly distorted, suggesting that the inner edge of the accretion disk may be quite close to the black hole — close enough for gravitational effects to wreak havoc with the X-rays streaming from the disk. This in turn implies a rapidly rotating black hole, since general relativity states that the faster a black hole is spinning, the closer its disk can come to it, Harrison said. “This has been a big controversy — which of the two is going on?” Harrison said. A combined observation of the supermassive black hole at the centre of the galaxy NGC 1365 by two orbiting observatories (ESA’s XMM-Newton and NASA’s NuSTAR) provided the best view ever of the black hole. Pinning down a black hole’s spinThe $165 million NuSTAR telescope, which just launched in June 2012, finally cracked the case. Using NuSTAR’s super-sensitive measurements of high-energy X-rays, the astronomers calculated that the purported gas clouds would have to be incredibly thick to produce the observed distortion levels — so thick as to make the whole idea untenable, at least in the case of NGC 1365’s black hole. The research team, led by Guido Risaliti of the Harvard-Smithsonian centre for Astrophysics and the Italian National Institute for Astrophysics’ Arcetri Observatory, calculated this rotation rate to be 84 per cent of that allowed by general relativity. It’s tough to comprehend this figure, since it doesn’t translate well into miles per hour. But it’s safe to say that the black hole is spinning incredibly fast. The new study was published online today (Feb. 27) in the journal Nature. Astronomers think supermassive black holes acquire most of their spin as they grow, rather than being born with it. So studying their rotation rates can yield insights into how these monsters have evolved over time. 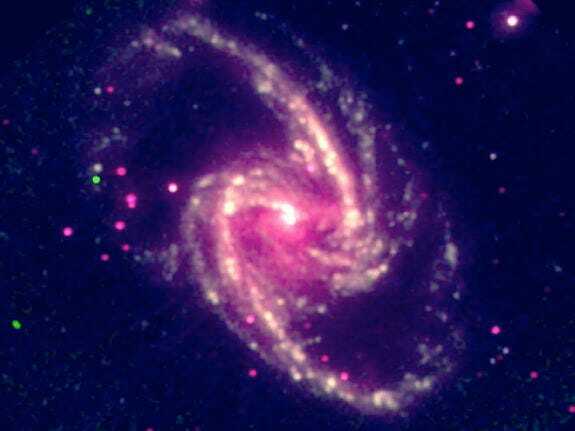 The superfast spin of NGC 1365’s black hole, for example, implies that it did not grow via numerous small black-hole mergers, Harrison said, since the odds are very low that many such chaotic events would spin it up in the same direction. 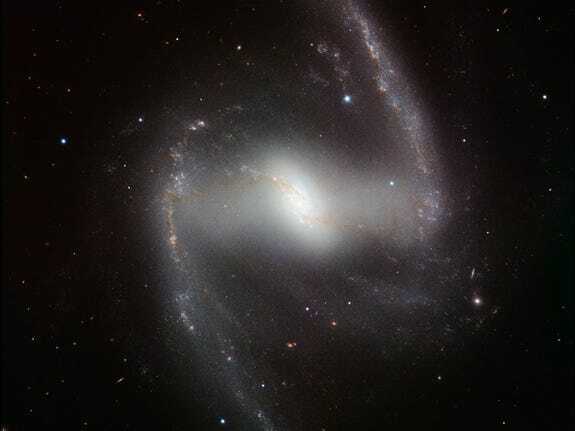 Rather, it’s more likely that NGC 1365’s central black hole acquired its spin from one major merger, or simply by gobbling material from an accretion disk that has remained stable over the long haul. The new study represents a first step toward a better understanding of the nature and evolution of supermassive black holes, Harrison said.